Instead, let’s turn our attention to one of Britain’s more overlooked, but nevertheless extremely attractive, bridges. You’ll find it in the rather unlikely surroundings of Runcorn, north-west England, a town whose only other claims to transport fame are its longstanding segregated busway system, and the railway bridge which sits next to the subject of this blog entry. It’s the Silver Jubilee bridge, carrying the A533 over the River Mersey and Manchester Ship Canal. 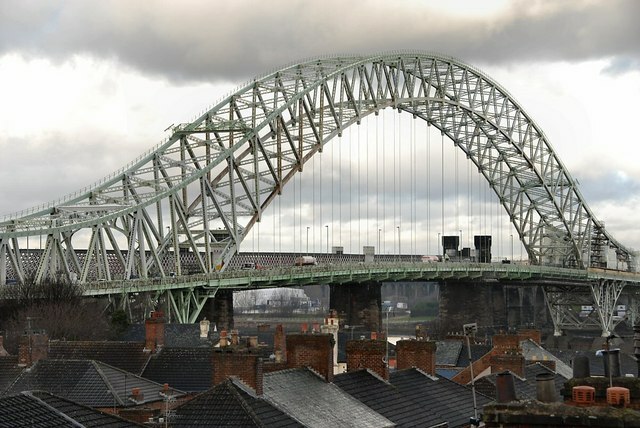 Opened in 1961 as simply “Runcorn Bridge” it was renamed in 1977. It has a total length of some 480m, is nearly 90m at its highest point, and is Grade II listed. It was the largest steel arch bridge in Europe when it was constructed, and is an example of a “through arch” bridge. The Silver Jubilee Bridge at Runcorn. Sourced from geograph.org.uk, here. © Copyright Galatas and licensed for reuse under this Creative Commons Licence. Arch bridges with a deck on top are a good way of crossing a void, especially as you can place the foundations on either side of a river, rather than having to build in the water. But the wider the void you’re trying to cross, the bigger the arch has to be, and eventually the approaches to what becomes a humpback bridge become impossibly steep. So the other solution is a series of smaller arches – a viaduct – which is more complicated and costly to construct. Through arch bridges solve the problem of increasing arch height by threading the deck through the arch itself. But that means suspending the middle part of the deck (within the arch), and supporting the outer parts (outside the arch). That requires steel – so this type of bridge has only been possible since the industrial revolution; you couldn’t make one from stone. The through arch design has been employed on some of the world’s most famous bridges, including the Sydney Harbour Bridge. You’ll also find it on the Tyne Bridge in Newcastle. Unlike the Tyne Bridge, but like the Sydney Harbour Bridge, the arch on the Silver Jubilee Bridge’s arch flares out very attractively at each end. But what makes the Silver Jubilee bridge especially attractive is that the side spans (the bits at either end beyond the foundations) are continuous with the main arch, rather than separate. Have a look at pictures of the Tyne Bridge of the Sydney Harbour Bridge and you’ll see that the side spans are separated from the main span by masonry towers. It lends the Silver Jubilee Bridge a unity and sinuosity that is quite lovely. It’s been a popular success as a bridge, and road traffic has increased to the extent that another road crossing is now proposed. The artist’s impression of the Mersey Gateway bridge shows a not unattractive cable-stayed structure. But whatever its exact final form, I doubt it will look as lovely as its older companion.